This 18″, 11-circuit maple Chartres labyrinth pattern is the most popular design in North America and is based on the famous labyrinth that was inlaid into the floor of Chartres Cathedral in France in the 13th Century. Many people travel to this Notre Dame cathedral to walk this pattern. 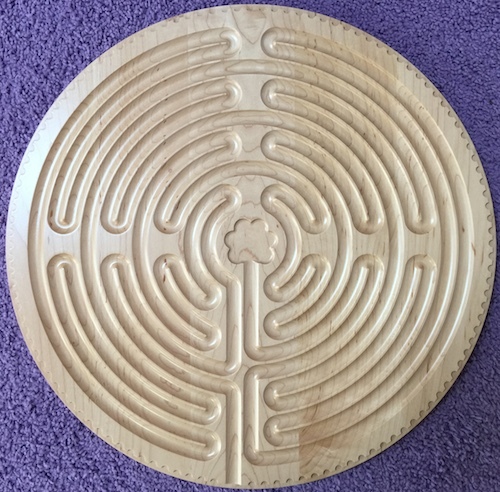 This maple Chartres labyrinth design is longer to traverse than the Cretan, and therefore the journey to the center oftentimes will be deeper and more introspective than the Cretan pattern. Weighing about 4 lbs., it has a wide finger path, a notch for hanging and engraved suggestions for use on the back. During the 13th century, this design was inlaid into the floor of Chartres Cathedral in France. It was adopted by the church during the Middle Ages as a substitute for the physical pilgrimage early Christians made to Jerusalem. The 11 circuits & center may represent the 12 apostles. There are 113 teeth known as “lunations” which adorn the outside of the pattern and many believe the ancients used these lunations as a sundial in order to determine the lunar feast of Easter. The center area (rosette) is a six-petaled rose that some believe represents the Virgin Mary or cosmologically, the six kingdoms of existence; mineral, plant, animal, human, angelic, divine. It is thought that by spending time in a petal representing a kingdom that embodies a quality that you are trying to emulate (i.e. the mineral and plant kingdoms teach us patience), you will come to better understand that quality. This labyrinth frequently takes you close to the center and then back towards the outside of the design. This pattern can represent coming close to and moving away from your personal, transformative center, a place of intense knowing and change. This maple Chartres labyrinth or lap labyrinth functions in much the same way as a full-size walking labyrinth, (to further relaxation, meditation and prayer) except that the user traces the path to the center using their finger rather than their feet. For many, this combination of movement (tracing the path) with introspection (eyes closed), is a more relaxing way to meditate or pray. For those whose meditation or devotional practice seems demanding or sporadic, finger labyrinths provide a unique way to bring renewed vitality and meaning to these activities. Since 1997, we have been making this finger labyrinth design with wide, adult-sized finger paths. 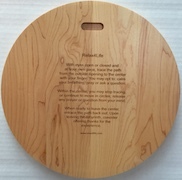 Due to the clear finishing, it can only be lightly sanitized between uses (using gentle soap and water). If more extensive sanitizing is required (such as in a hospital, nursing home, elementary school etc. ), we recommend our finger labyrinths made from food grade, commercial plastic material.